Preheat the oven to 200°C/gas mark 6, then grease a 6-hole muffin tray. Line the holes with squares of baking paper, folding around the edges as they are placed, to make muffin cases. They may need weighing down momentarily with a pepper grinder or similar object. Fill a large saucepan halfway up with boiling water and bring to the boil. Turn the heat down until simmering, and lower 6 of the eggs into the water. Simmer for 6 mins until soft boiled. Drain and cool in cold water, then peel carefully. Whisk the remaining eggs in a bowl, then add half the chopped bacon, the melted butter, plain flour, baking powder, milk and parsley, and season with pepper. 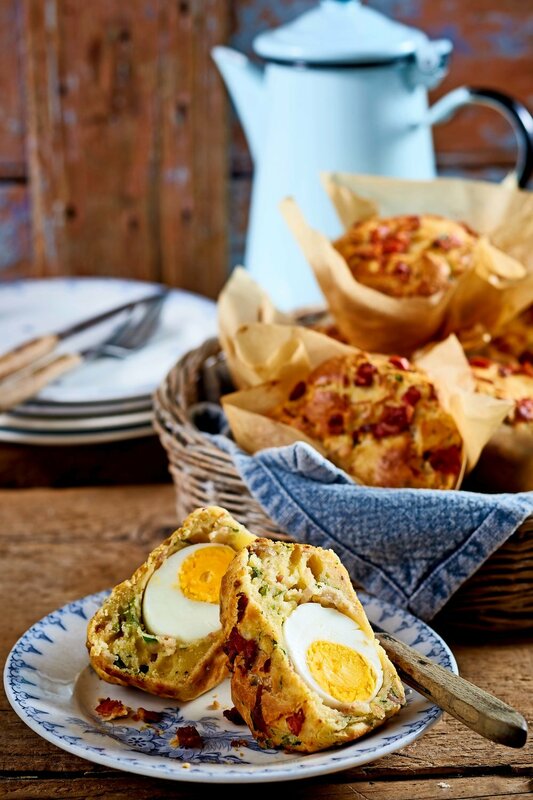 Scoop a spoonful of batter into each muffin case, then place one boiled egg on top of each spoonful. Divide the remaining mixture between the cases, covering the eggs. Sprinkle the tops with the remaining bacon pieces. Bake for 25 mins until golden. Allow to cool slightly on a wire rack before serving.